23 « October « 2012 « Nothing in Biology Makes Sense! The amount of research happening right now on microbes and human health is enormous. Think multi-hundred-million dollar, international-collaboration enormous. I’m sure the interest has been building for a long time, but the game changer I’m aware of is Ley et al. (2005), which showed that bacterial communities in obese mice were statistically similar to those from other obese mice and statistically different from normal-weight mice. Turnbaugh et al. (2006) showed that the shift that occurs from normal to obese* microbial communities favors microbes that are more efficient at extracting energy from a given amount of food. I’ll repeat that part: obese individuals extract more calories from a given piece of food than normal-weight individuals extract. The obese individuals have lower bacterial diversity, a trait that has also been linked to allergies. The childhood obesity epidemic is of particular concern to us all – up to a third of American children are obese and the detrimental health effects of this disease are well documented. Having a well-functioning gut microbiota may be a key to healthy weight. That brings me to today’s topic: human breast milk (which I’ll refer to as HBM for the rest of the post). Cabrera-Rubio et al. (2012) analyzed the bacterial composition of HBM from 18 women at three time points over 6 months. The mothers in the study varied in weight and delivery method. The researchers were basically exploring what factors influence the microbial composition in breast milk, with an emphasis on weight of the mother. They used next-generation sequencing to produce a library of sequences that were analyzed for what specific bacteria were found in each sample and how the samples relate to one another as whole communities. 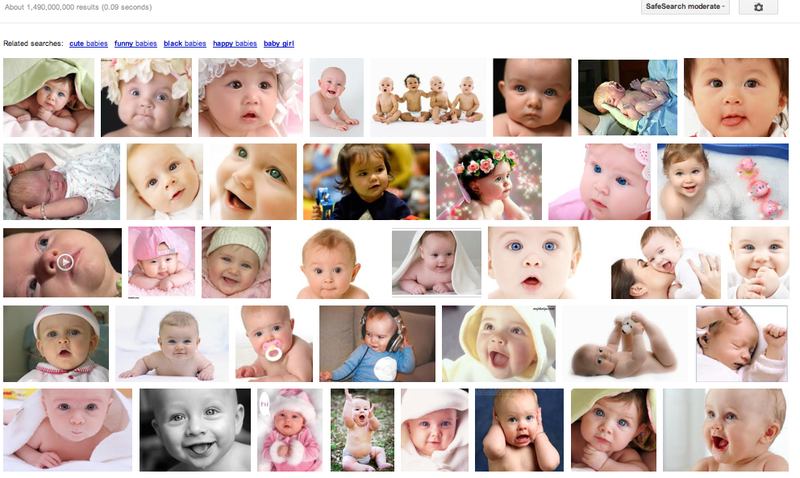 I couldn’t bring myself to Google image search “human breast milk” so instead I searched “babies”. Note1: there were over a billion hits (click the image to see the little text above it). Note2: the third “Related Searches” term was “black babies” which made me think – why ARE all the Google babies the same color? Curious.